Fall is upon us and it’s finally starting to cool down in Valencia! I’m excited to actually be able to take the girls outside to play in the park. It was nearly impossible to do so in the summer due to the scorching heat. 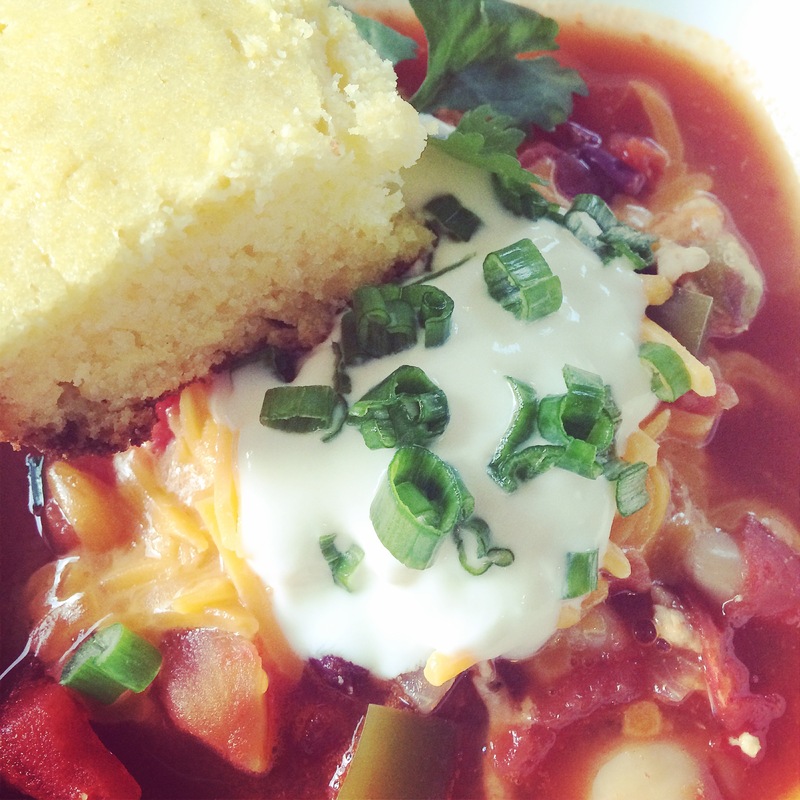 To celebrate the beginning of autumn, I’m posting a turkey chili recipe and a cornbread recipe. It’s a healthy and hardy meal with lean turkey meat, beans, and veggies. Enjoy! 1) Sautee garlic, onion, and bell pepper with olive oil over medium heat. Season with salt and cook 5-8 minutes until the vegetables have softened. 2) Increase heat to medium high and add turkey. Break up the turkey and cook about 4-6 minutes until the turkey is no longer pink. 3) Add all the herbs (except bay leaf) to the turkey and veggie mixture and cook about 1 minute. 4) Add tomatoes and chicken broth, stir, and bring to a simmer. Add the beans and bring to a simmer. Reduce heat to medium low and add the bay leaf and simmer, stirring occasionally about 30 minutes to an hour. 5) Remove the bay leaf and season with more salt as needed. 6) If you like thicker or chunkier chili, add a few tablespoons of tomato paste to thicken the broth. 7) Serve with additional toppings and cornbread! 2) Combine cornmeal, flour, sugar, baking powder and salt in medium bowl. Set aside. 3) Combine buttermilk, melted butter and egg in small bowl. Mix well. 4) Add milk mixture to flour mixture and stir until few lumps are left. Do not over mix. Pour into prepared (greased) 8X8 baking pan. 5) Bake for 20 minutes, or until toothpick comes out clean. *Can easily double recipe by using a 9X13 pan. Ever since watching Frozen, my daughter Annelise has been smitten with Elsa and Anna. Every night, she asks me before falling asleep – “Where’s Elsa? Where’s Anna?” So, of course, for her 3rd birthday party, I decided on a Frozen themed party for her. It was a lot of fun coming up with different ideas on Frozen inspired decorations and activities and of course desserts! I decided to work with blue, white, and dark purple colors for the decorations. Elsa’s gorgeous aqua blue dress was the inspiration for all the blue decorations. For the main backdrop, I used two types of blue tulle (a glittery aqua blue and a deeper blue). I simply hung the tulle onto our two curtain rods in the living room. I also hung up white tissue paper balls (inspired by snowballs of course). I painted a canvas aqua blue and painted Olaf’s sweet quote about love with white lettering. 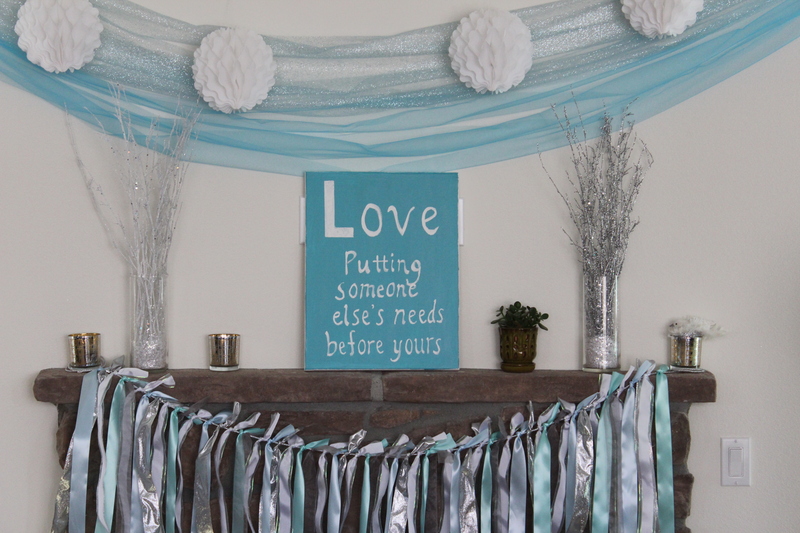 On the mantle, I hung a ribbon banner composed of white, silver, and baby blue ribbons. 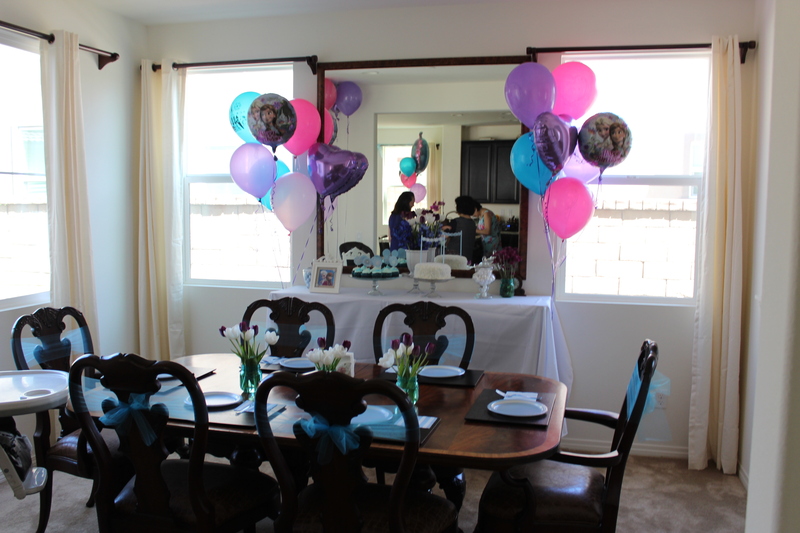 The balloons were purple, pink and blue (inspired by Anna and Elsa’s outfits). 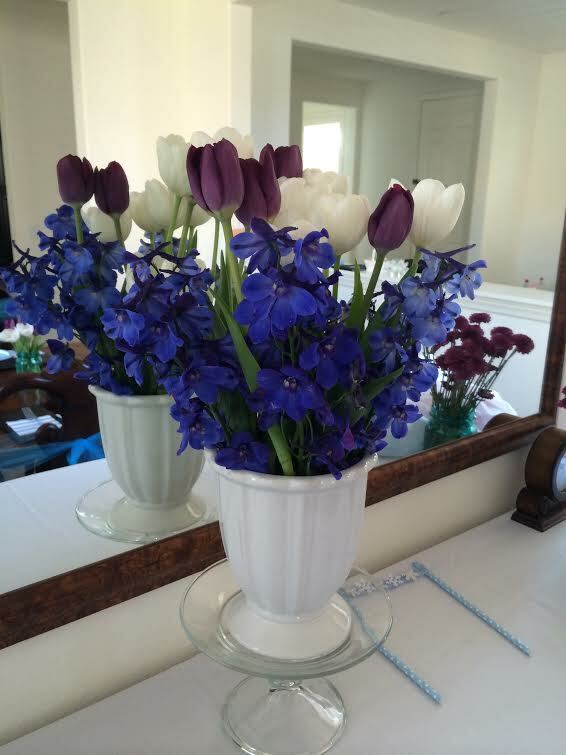 For the floral arrangements, I used purple delphinium and white and purple tulips. I bought an Olaf poster and made his carrot nose out of orange felt. Super simple! 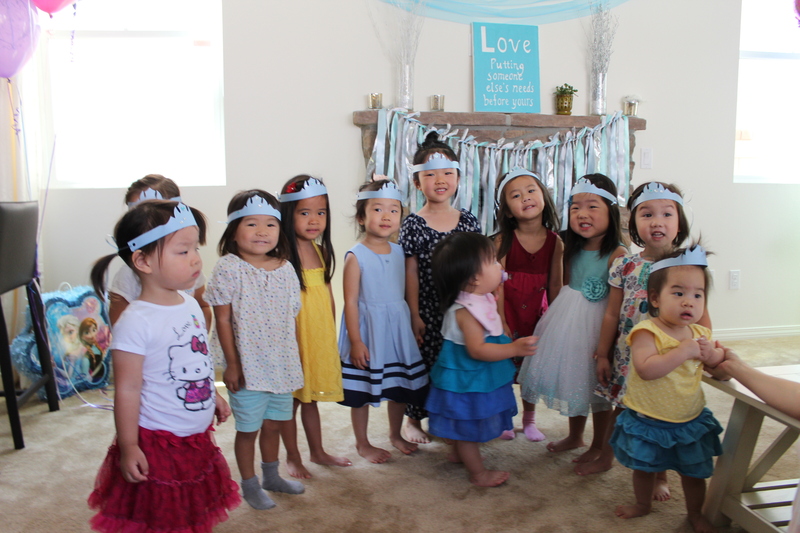 We made crowns using baby blue paper, decorated with jewel stickers. I hole-punched the two ends of the crown and looped thin ribbon through the holes so the girls could tie the crowns around their heads. How cute do these little princesses look?! I baked a simple coconut cake. The flaked coconut really looks like snow! The great thing about this cake is you don’t have to worry about frosting it perfectly since you get to cover the frosting with the coconut. 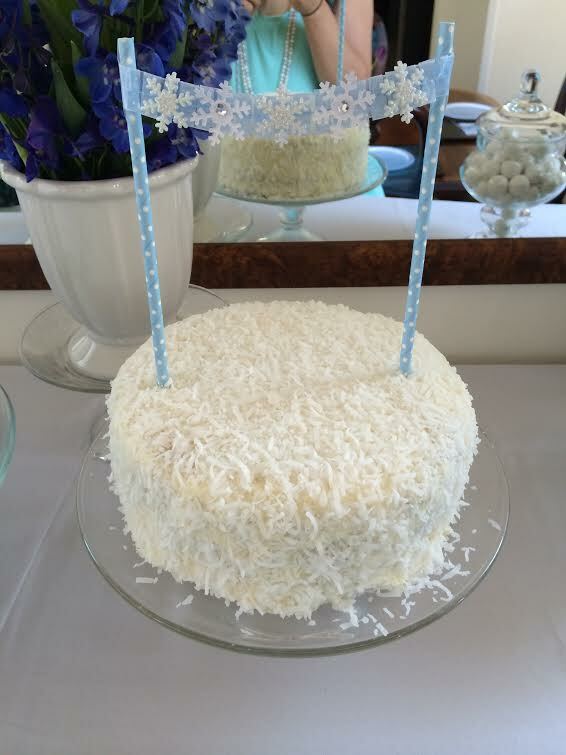 I made an adorable banner for the cake using blue and white polka dotted straws and a baby blue ribbon decorated with white snowflake stickers. Recipe – I used Ina Garten’s recipe for coconut cake. I baked chocolate cupcakes frosted with a cream cheese frosting. I created baby blue frosting by mixing the frosting with Wilton’s Sky Blue Icing. 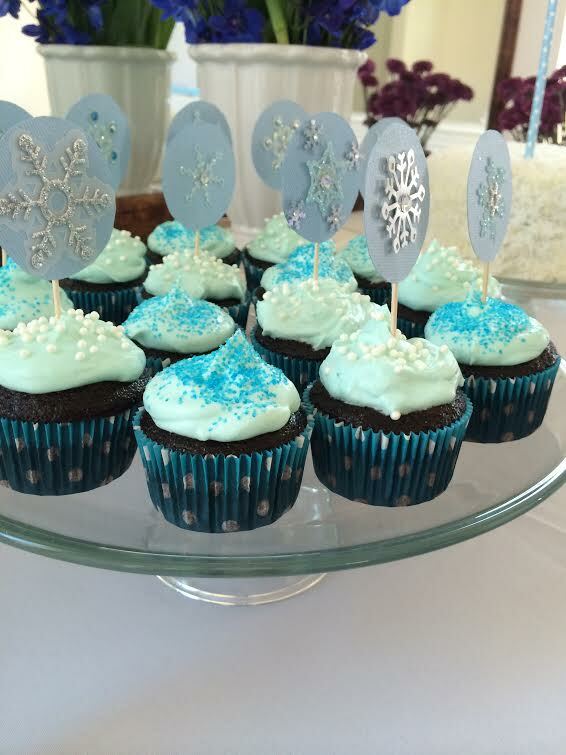 Then I decorated the cupcakes with white pearls or blue sprinkles. For the cupcake toppers, I used snowflake stickers that I found at Michael’s. Recipe – I followed Glorious Treats blog’s chocolate cupcake recipe as well as the cream cheese frosting recipe. Hope this inspires your creativity for a fun-filled Frozen party! 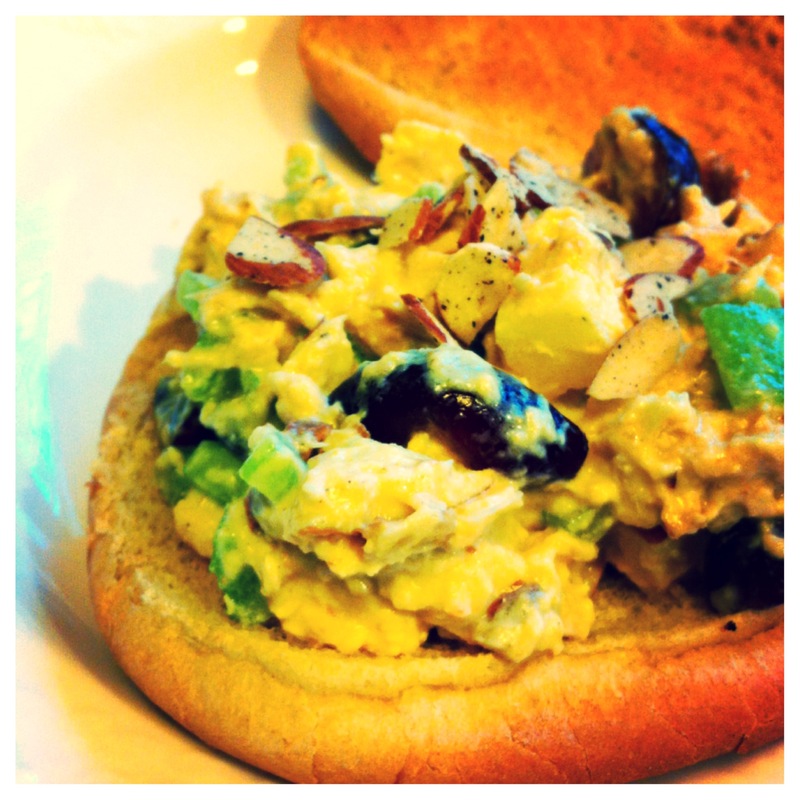 Here’s a quick and easy recipe for curried chicken salad. The curry powder adds a kick and a punch to your average chicken salad. The grapes and apple add a delightful sweetness and the slivered almonds give this salad a wonderful crunchy texture. This recipe is great for when you have leftover cooked chicken. We love Costco’s Rotisserie chicken because it’s so moist and tender. I ended up using the leftover rotisserie chicken to make this curried chicken salad. 1) Mix all ingredients into a bowl. You can substitute the mayo completely with yogurt if you’d like a healthier alternative. I like to do half mayo, half yogurt. 2) Serve on your favorite bread or you can eat it as a salad by itself. As a busy mom of two little ones, I’m always on the look-out for quick/easy/yummy recipes. 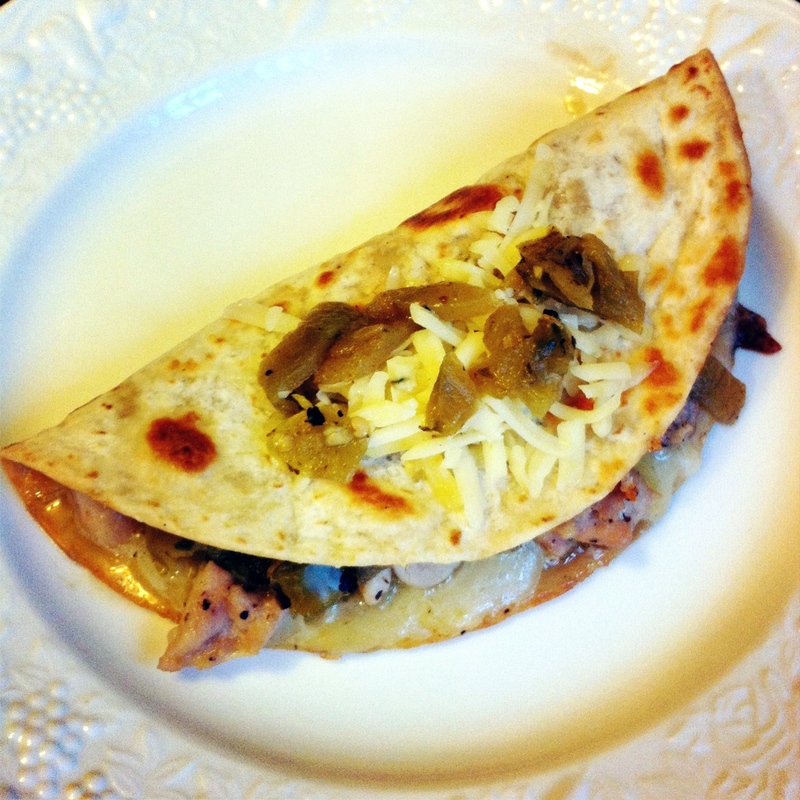 Here’s a simple chicken verde quesadilla recipe that I tried for the first time tonight. 1) Melt butter in pan over high heat. Place a tortilla onto the hot pan. 2) Place shredded cheese onto tortilla. Then top with chicken and green chiles. 3) Fold the tortilla in half when the bottom of the tortilla is browned. The quesadilla is ready when the cheese is gooey and melted and the tortilla is brown and crisp. 4) Serve and enjoy with your favorite Mexican toppings. I love to put sour cream, salsa, and guacamole on my quesadillas! No fancy V-day dinner out for us tonight. It can be impossible to go out when you have a newborn and a toddler at home. But I still wanted to do something special for hubby. My husband (and I!) love all things red velvet. 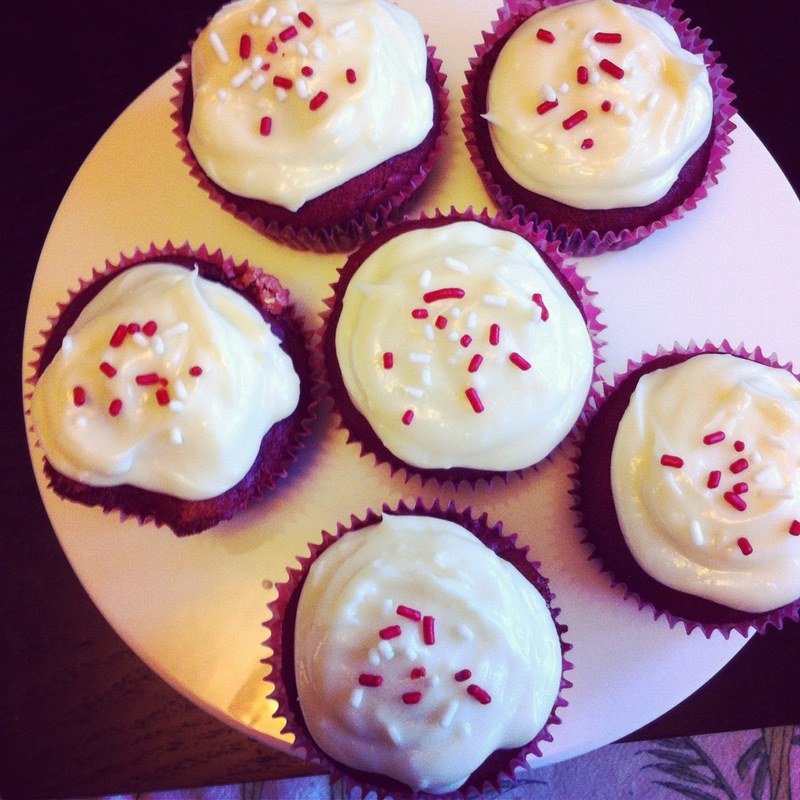 So I decided to make my first attempt at baking red velvet cupcakes. I followed the McCormick Holiday recipe I found on allrecipes.com. The sweet cocoa and the richness of the cream cheese frosting make this treat so delectable! I used festive baking cups which I placed into the muffin pan. I also decorated the frosting with red and white sprinkles. Preheat oven to 350 degrees F. Mix flour, cocoa powder, baking soda and salt in medium bowl. Set aside. Beat butter and sugar in large bowl with electric mixer on medium speed 5 minutes or until light and fluffy. Beat in the eggs, one at a time. Mix in sour cream, milk, food coloring, and vanilla. Gradually beat in flour mixture on low speed until just blended. Do not overbeat. Spoon batter into baking cups or muffin pan, filling each cup 2/3 full. Bake 20 minutes or until toothpick inserted in cupcake comes out clean. Cool in pans on wire rack 5 minutes. Remove from pans and cool completely. Frost with vanilla cream cheese frosting. Vanilla cream cheese frosting: Beat softened cream cheese, butter, sour cream and pure vanilla extract in large bowl until light and fluffy. Gradually beat in confectioners’ sugar until smooth. It’s a miracle that I managed to bake these cupcakes in between nursing, burping, diaper-changing, and putting Kate to sleep! Thankfully my mother-in-law is here and she graciously helped watch the kids while I was in the kitchen.